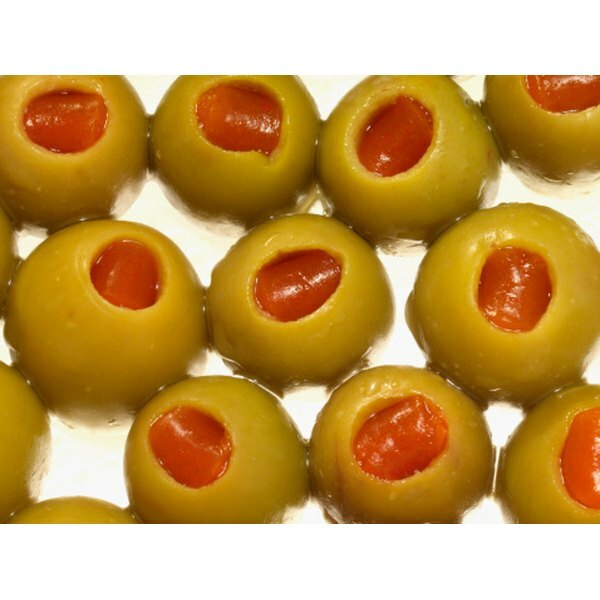 Green olives are often stuffed with pieces of pimento pepper. 3 What Kind of Seasoning Do You Put in White Bean Soup? Preheat an oven to 375 degrees Fahrenheit. Rinse the peppers under cool running water for a minimum of thirty seconds each and pat dry with paper towel. Place the whole peppers in a glass baking dish or metal pan. Brush the entire surface of each pimiento pepper with a liberal dose of pure olive oil. You can use extra virgin olive oil, but it's not necessary. Place the peppers in the oven for 10 to 15 minutes to cook. Remove the dish from the oven with a pair of oven mitts on your hands. Pick each pepper up with a pair of tongs and turn it over so it will roast evenly. Place the dish back into the oven and cook for another 10 to 15 minutes. Remove the dish and rotate the peppers once more. Cook for an additional 10 to 15 minutes and remove the peppers from the oven as long as the skin is visibly separating from the pepper. Cover the dish or pan with plastic wrap and allow the peppers to completely cool. Peel the skin from the peppers with the edge of a sharp knife or your fingernails. Scoop out the core and seeds with a spoon and discard. Eat the pepper as is, slice it into strips or chop it. For storage, place in a container with a lid and cover with olive oil. Seal the lid tightly and put in the refrigerator for up to three days. You can roast the peppers more quickly at a higher temperature of 450 degrees Fahrenheit. Beware that the outer skin may become charred.